The Angora cat, as its name indicates, comes from Angora in Western Asia, the province that is celebrated for its goats with long hair of fine quality. In fact, the hair under the Angora cat's body often resembles the finest of the Angora goatskins. 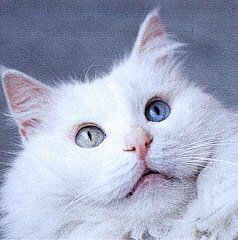 Angora cats are favorites with the Turks and Armenians, and exist in many colors, especially since they have been more carefully bred. They vary in form, color, and disposition, and also in the quality of their hair. The standard calls for a small head, with not too long a nose, large eyes that should harmonize in color with the fur, small, pointed ears with a tuft of hair at the apex, and a very full, fluffy mane around the neck. This mane is known as the "lord mayor's chain." The body is longer than that of the ordinary cat in proportion to its size, and is extremely graceful, and covered with long, silky hair, which is crinkly like that of the Angora goat. This hair should be as fine as possible, and not woolly. The legs are of a moderate length, but look short on account of the length of hair on the body. Little tufts of hair growing between the toes indicate high breeding. The Angora cat, in good condition, is one of the most beautiful and elegant creatures in the world, and few can resist its charm. The tail is long and like an ostrich plume. It is usually carried, when the cat is in good spirits, straight up, with the end waving over toward one side. The tail of the Angora serves as a barometer of its bodily and mental condition. If the cat is ill or frightened, the tail droops, and sometimes trails on the ground; but when she is in good spirits, playing about the house or grounds, it waves like a great plume, and is exceedingly handsome. The suppleness of the Angora's tail is also a mark of fine breeding. A highbred Angora will allow its tail to be doubled or twisted without apparent notice of the performance.